When my fellow Argentinian tango dancing friend were talked into coming to Paris , part of the lure was that I would meet them at the airport with champagne. Lisa arrived first and I had a baggage trolley waiting - with two bottles of champage and plastic drinking cups. The next flight was long in arriving , so we had discovered that part of the theatre of a Paris airport is that you are considered a performer-in-the-round. People admired our panache and chatted to us as we sat and sipped our bubbles. "Do you think Paquita really will be there with champagne?" The second bottle was opened, we met more people and finally all exited - stage right. is always of how the birds come home to roost. For those of us who like to wander or just sit and observe when there, Paris Theatre surrounds us. Paris is our play, our theatre. We can imagine the endings, the relationships, the possibilities – and sometimes we just observe the stage itself and watch how its actors draw from the environment. 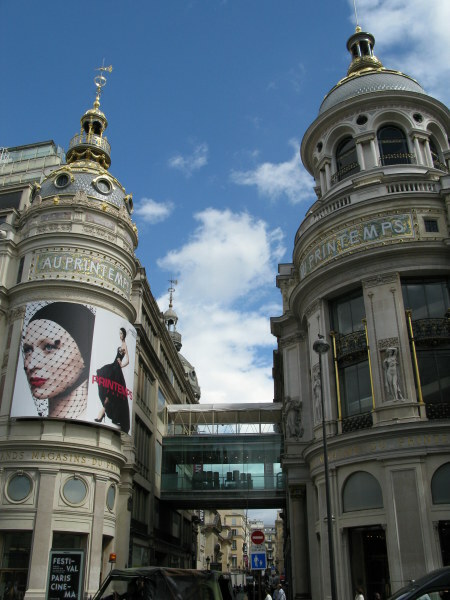 Not all its playhouses are theatres – as with the two great stages of Paris shopping: Au Printemps and Galéries Lafayette – both, I think appropriately, on Boulevard Haussmann. 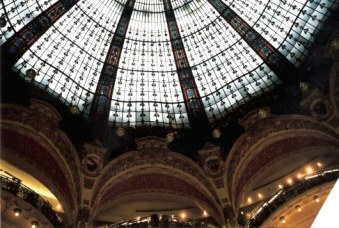 The Galéries Lafayette are cameos of fashion, stages layered as if they are opera boxes beneath a glass and steel dome. It is Paris Theatre drawn with all the elegance you would expect of Paris. 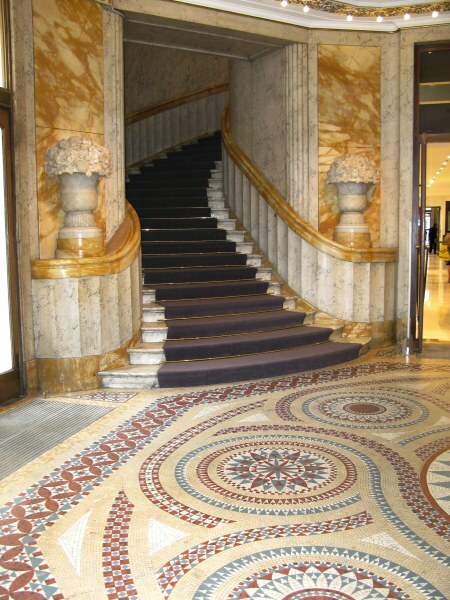 You reach each floor either by Art Deco stairways or the more traditional elevators and escalators. 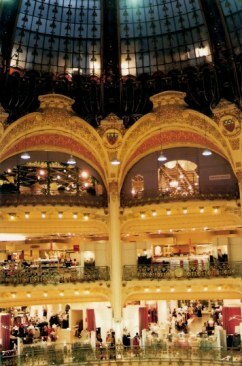 The elaborate glass dome illuminates the whole stage of this unique Paris shopping experience. Another hallmark of Paris theatre is that in Galléries Lafayette they understand that a gentleman accompanying his lady on a shopping spree needs sustenance. There is a small bar for just such a purpose, placed close to the escalators so the lady with her parcels may glide down to collect him. there is a marvellous view from their lofty Restaurant Le Déli-cieux – or you could dine right under the dome in the brasserie. The stores are magnificent outside and in. This is a stage for Paris theatre that draws you in to become part of the play. The entrance of Au Printemps is as tempting as what is inside. Although I find the extent of choice in such emporiums rather overwhelming, I can always treat myself to Paris theatre-in-the-round by roaming about for a short while absorbing the drama of it all - but usually leave without purchasing anything. I rather thought on my last visit that these shoes characterised how ridiculous fashion can be, and how the necessity to shop for 'Brands' can be some sort of collective tribal lunacy. Rather than shop in the big stores, I like to 'window shop' in Paris, especially in the small back strates rather than on the grand boulevards. Window shopping sometimes ebnefits from a guide - and mine is always the latest edition of ‘Paris Par Cher’ ('Inexpensive Paris'). This handy little guide will help you to seek out a treasured place meant for the locals and a little ‘off the beaten track’. The version here is in French, but is online so forever handy. 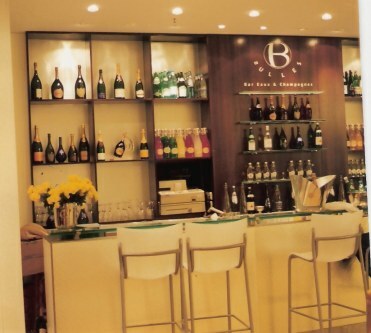 suggest restaurants (by arrondissement) with notes on their specialties, samplings of menu and indicative prices. 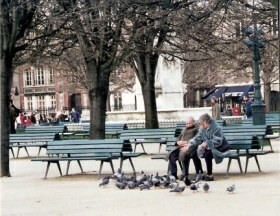 In Paris there are lots of places to sit and read: or sit and feed the birds, or watch the passing parade, or think – or just, simply, to sit! One of the delights of Paris is that often it presents 'po-up-theatre' and sometimes you are part of the cast. In this case, we were wandering the back stret of Montmarte when we heard tango music drifting romantically from the windows of a nearby apartment. In a flash one of our group gathered me up and we danced over the cobbles in that magic that embraces Argentinian tango, enhanced by being set on an unlikely outside theatre stage in Paris. I think wandering in a foreign place does bring you in harmony with it, for you have opened your mind and your senses to meet the new – and have no expectation of what will follow. Wandering in Paris draws one eventually to the Seine and it was in one of its more remote marinas that a piece of Paris theatre unravelled. It is one of the stories that make travel so memorable. Here we saw ‘the chickens come home to roost’ in a small impromptu performance. We were leaning over the railings watching a fully grown Rottweiler dog who was standing watch on a Seine barge that was obviously a houseboat. He was sitting on watch when we first saw him, chained on a long runner chain that, once he decided to get up, enabled him to have the ability to roam freely over the deck but not to stray ashore. Then, he saw a man walking too close to his boat. He barked a warning. When the man continued to walk along the quay parallel to the barge, the over-enthusiastic dog, leaning on the barge railing, slipped and fell overboard. We gasped, expecting him to be hung. 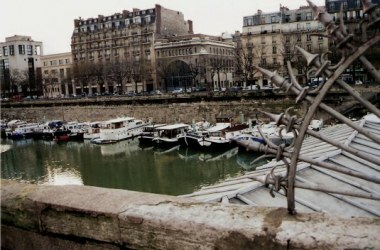 However, the chain had a release catch for just such a contingency and he fell in a massive belly dive into the Seine. The problem that followed was that there was no foothold for the dog to climb ashore up the high concrete canal wall.The man against whom he had been protecting his territory now became the dog’s saviour. He reached down to catch the now increasingly desperate animal, whose paddling was slowing after two laps of the barge. By seizing the collar and by an enormous physical effort, the man heaved the sopping wet dog up to safety - and was promptly rewarded by a shower of Seine water. The animal shook himself, shivering both in shock and in response to the biting wind on his now soaked fur. The play continued to unfold. The man brought the dog back onto the deck of his boat and hailed the owner, who eventually emerged. He immediately grasped the situation, taking the dog by the collar, and gratefully shaking the hand of the rescuer. The dog however, had no intention of letting his rescuer leave. He wriggled free and cavorted around the man, licking his outstretched hand and nudging him back every time he went to go down the gangplank. The two men laughed. The dog was recaptured and looked on forlornly as the walker returned to the path. Later we returned the same way and through a porthole saw the owner drying the animal off with a hair dryer! 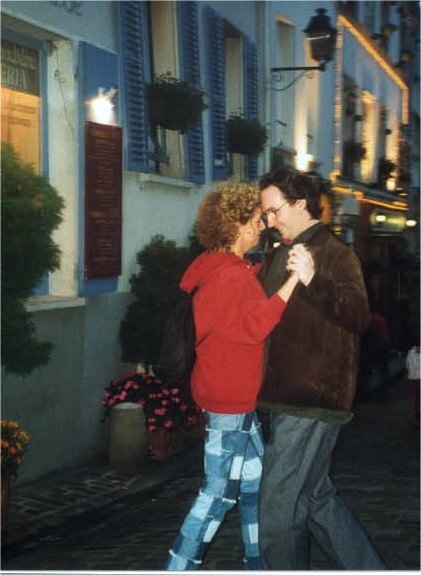 Arriving from Australia one year I had brought my Argentinian tango teacher with me, with a plan to hit every tango bar in Paris (a goal I think we very nearly achieved). Kristina had never been to Paris and her imagination of what it would be like was immediately consolidated with reality when, from the bus bringing us from the airport she saw a young man kneel before his lover beside a traditonal rounded street Tabac, and hold up an engagement ring in a velvet box. Ah Paris. It brings out the lover in us all. Paris theatre is always before your eyes as you wander the streets of this perennially magnificent city. … but in my travels I have been a happy spectator to the theatre of life displayed as only Paris can. Often it is in sharing the 'theatre of moments' that life spontaneously presents that we are bonded together with strangers - by a smile, or an ironic chuckle, in acknowledgement of the way the performers have touched our lives. It is not a small gift, and it is a gift of theatre that is free - but we have to take the time to allow space enough for us to see these performances of street theatre and recognise them as such. I believe that interesting places are interesting as much for their history as for the stories that you bring home with you, stories that mould the character of the place forever in your memory. For me, Paris IS theatre and I have brought home many memories of vignettes played out upon her stages.